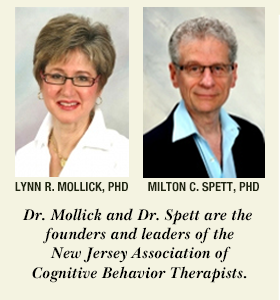 Cognitive Behavioral Psychologists of New Jersey - What Is Cognitive Behavior Therapy? Q. What is Cognitive Therapy? A. Cognitive Therapy changes the way you think about yourself, your experiences, the world, and all the important people in your life. Changing the way you think helps to relieve distress and eventually improves all aspects of your life. For example, we can help you change excessive worry, anger, overconcern with the opinions of others, and the tendency to put others' needs ahead of your own. Although we may ask about the past, we focus mostly on the present. We will give you guidance on how you can make the changes you want to make. Q. What is Behavior Therapy? A. Behavior Therapy changes your behavior. Changing your behavior leads to improvements in self-esteem, relationships, work and career. We will teach you how to communicate more effectively, and how to deal with problem situations as they occur. We will also show you what you can do to prevent problem situations from occurring in the future. Q. How is general psychotherapy different from Cognitive Behavior Therapy? A. Therapists who do general psychotherapy usually believe that psychological problems are helped by having a supportive relationship with your therapist and understanding your childhood experiences, especially your relationships with your parents. Cognitive Behavioral Psychologists believe that changing unhelpful thoughts and ineffective behavior is the most effective method for overcoming psychological problems. 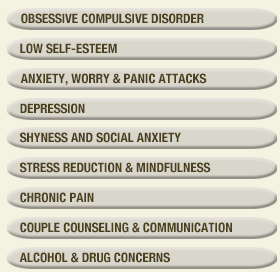 At Cognitive Behavioral Psychologists we will match you with a therapist you like and trust. They'll know which cognitive and behavioral techniques will help you get your life back on track. Q. I have had Cognitive Behavior Therapy before and it helped for a while, but my symptoms have returned. What can you do that wasn't done before? A. Because of all the recent publicity about the effectiveness of Cognitive Behavior Therapy, many therapists have learned a few cognitive and behavioral techniques and now call themselves Cognitive Behavior Therapists. The therapists at Cognitive Behavioral Psychologists of New Jersey have decades of experience in Cognitive Behavioral Therapy. We also write, teach and give lectures on Cognitive Behavior Therapy for mental health professionals. There are many forms of Cognitive Behavior Therapy, and there is a great deal of research on which techniques are most effective with each problem. We will discuss which forms of therapy did not work for you in the past, and we will recommend a better approach. We have been able to help many patients when their previous therapies did not.